If you are looking for information on the eAuction Traders franchise business opportunity, eAuction Trader franchises or eAuction Traders franchising, then you have come to the right place. You can become a part of an exciting new business opportunity by starting an eAuction Traders business. Sell products through eAuction Traders on eBay by owning a high-yield, low-investment business with no royalty percentage. We offer the lowest monthly fee in the industry! eAuction Traders opened its first store in Rochester, New York and it was an immediate success. As a result, eAuction Traders has quickly expanded and is working to help other people leverage an opportunity that has proven to be so successful to our CEO, Stuart Dizak. 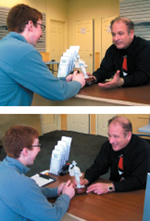 Mr. Dizak has over twenty years of success in franchising and has appeared before Congress on behalf of franchisees. As an eBay Powerseller, eAuction Traders has become a recognized leader in the fast-growing industry of auction trading. Our commitment to working with our affiliates is an integral part of our success. Enjoy greater profitability, one-on-one support, and complete turnkey operations. We are committed to leadership in this growing industry by creating a customer experience and corporate culture recognized for integrity, honesty and success. We provide our affiliates with the tools and corporate support to cultivate their individual entrepreneurial talents. We've recruited top software consultants, designers, legal counsel and other professional support staff to help formulate our total-service business model. Don't miss this unique opportunity to become a part of one of the most exciting, nationally-recognized companies in the industry today. Our commitment to your success shows on the faces of our customers, our staff and, our affiliates. We encourage you to become part of the growing eBay market by joining the eAuction Traders team today.